Being stressed out is a crutch, yo. One was scuttling along on a recent afternoon, marveling at the wonders of Queens. My day’s photographic targets having been captured, and fully entranced by one of my favorite HP Lovecraft audiobooks (The Horror at Red Hook, read by Wayne June), the path I was on had been chosen to get me home to Astoria from Newtown Creek as quickly as possible via 39th street in Sunnyside. There’s bunches of lovely residences along this stretch, but my visual instinct is generally unexcited by homes and gardens. Nevertheless, the camera is always ready to click and whirr should something interesting pop up. I am, it should be mentioned, fascinated by the concrete clad topography of Western Queens. The “lay of the land” as it were. There’s all sorts of elluvial hillocks and ridges hidden beneath all the asphalt and brick, and when you walk these streets a lot, you can easily discern where water once flowed or pooled prior to the massive land reclamation and drainage projects of the early 20th century. 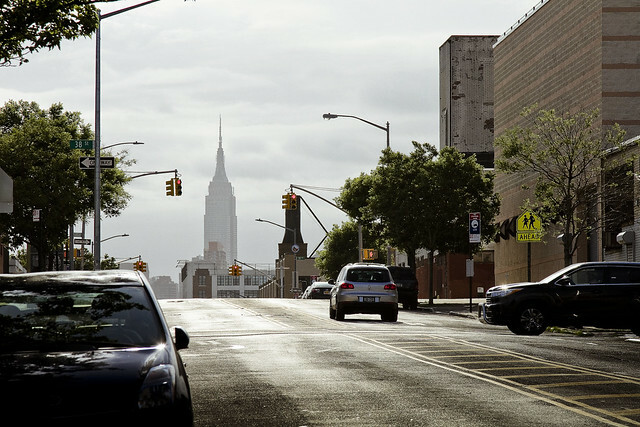 These projects, and the concombinant political corruption involved with the execution of them, ended the careers of several of the early Borough Presidents of Queens in court. 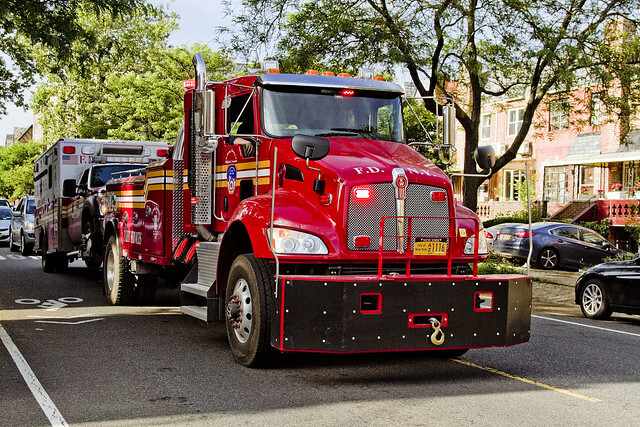 File the shot above under “you don’t see that every day,” and even for a humble narrator who has become jaded by the wonders of municipal industry, it isn’t every day that you see a heavy tow truck clad in FDNY trade dress towing an ambulance. I’m sure that the combination was ultimately heading for Maspeth, where the Fire Department maintains a couple of vehicle maintenance facilities. After capturing the shot, I offered the driver a friendly wave of the hand. He smiled and waved back. Only employees of the FDNY seem to do this, amongst all the City agencies. Cops and Sanitation workers just kind of glare at me. I figure anything that a City employee is driving is partially owned by me anyway, so click and whirr. The shot above is from a different afternoon, the day that the Bicycle Fanatics came to Sunnyside to stage a protest. I took a bunch of shots of their “human protected bike lane” hooey, but do not wish to inflate their egos or cause any further than necessary. 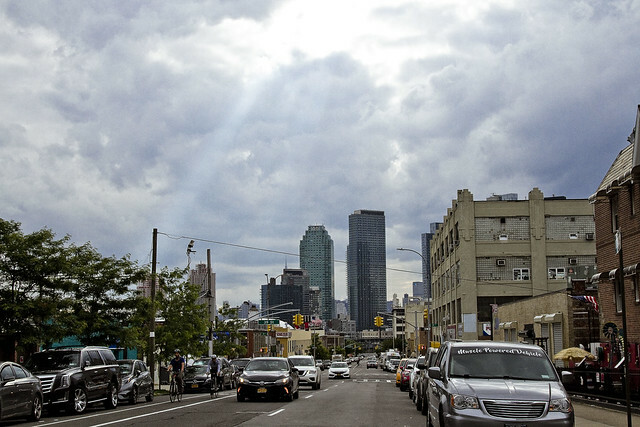 Accordingly, the crepuscular rays dancing about the Sapphire megalith and the ominous mestastase of the LIC skyline are presented instead.